Bangal..a name given to people from eastern part of undivided Bengal, now Bangladesh , are famous for their rich and diverse cuisine. Its very said that we have a recipe for almost anything. Its true. Bangal cuisine has a wide variety to it, from sour to sweet, from mild to hot, there is something for everyone. Today’s effort is to recreate one such humble dish which although is pretty simple, is very delicious nonetheless. 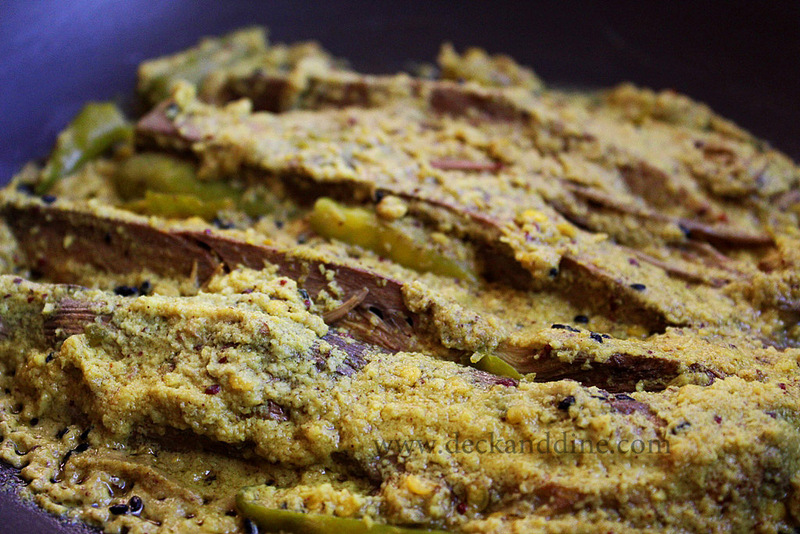 It is a very typical Bengali recipe, using mocha (well, this is nothing related to coffee or chocolate, but banana blossoms which is rich is iron and other minerals), freshly made mustard, chili and coconut paste. 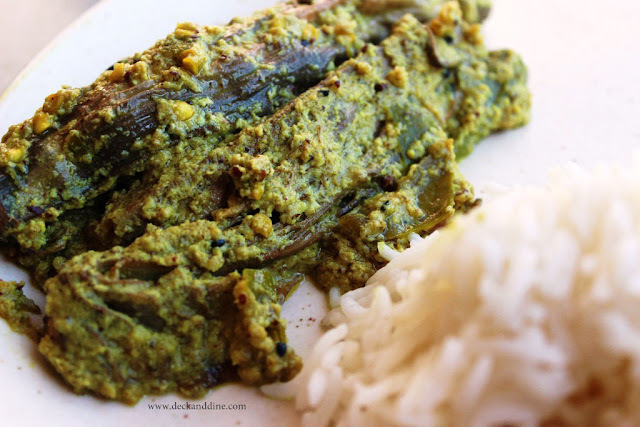 The combination of mustard coconut and green chilli is like a Holy Trinity of Bengali or Bangal cuisine. This flavor is cherished by Bengalis’ everywhere. Today’s dish sports this power packed combination which gives it a quintessential Bengali home touch. So presenting, Sorshe Mocha or Banana Flower in spicy mustard gravy. Enjoy. Take the banana core and cut it lengthwise into 4/6 parts. Parboil it in a pressure cooker with salt and a pinch of turmeric. When it is done, take it out and let it rest. Heat oil in a pan/wok and add Nigella seeds to it, when they start popping, add the parboiled banana flower core to it and cook on low flame, keep turning them over at regular intervals. Add salt and sugar and cook for a couple of minutes. Add the mustard and green chili paste and coconut paste and stir them in properly. Pour in around a cup of water, cover and cook till done. Add slit green chilies just a minute or two before turning off the flame. The motive of adding green chilies in this stage is to retain the aroma of the raw chilies. Turn off the flame when the gravy thickens and add a spoon of mustard oil. From the snaps you share it looks delicious and worth trying. Will give it a shot on the weekend but it looks bit difficult and I am not sure whether it will be good or not.